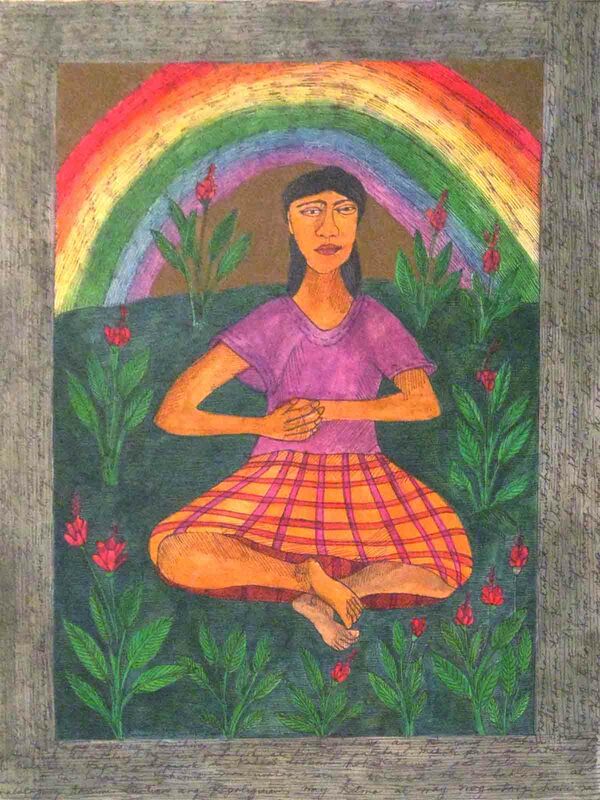 In this series of works of Brenda Fajardo, we get a good glimpse of her abiding interest, or better to say, her resolute belief in the potency of woman, of the tarot, and of the myth. 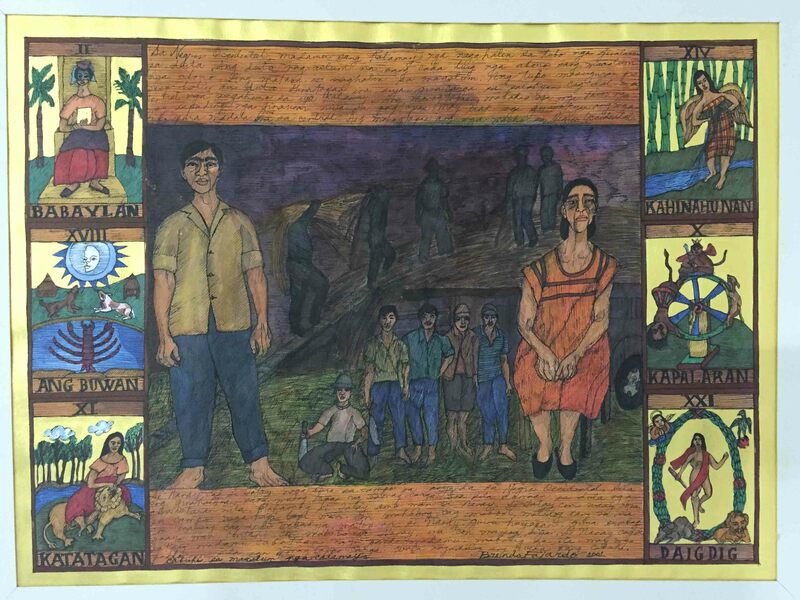 This is the leitmotif that runs through the pieces that are exhibited at the heart of Fajardo’s native clearing as well as the crucible of her creative vocation. 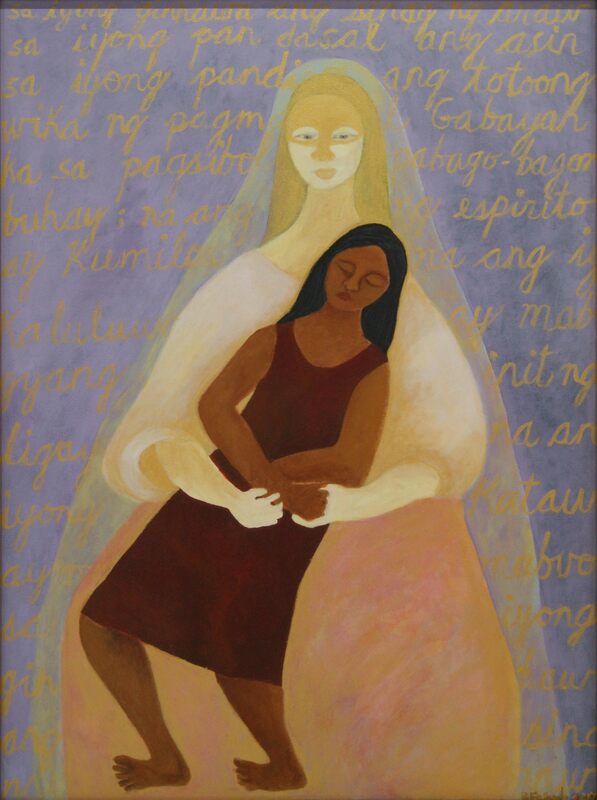 Negros has significantly honed her art and continues to shape her ties to it. 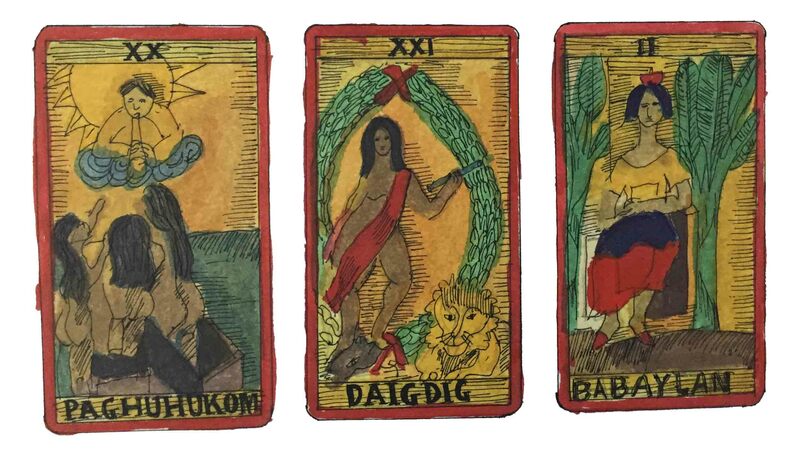 It is the land and its history inhabited by people of the day and ancestors of the seasons that have imbued her temper with a vital energy. 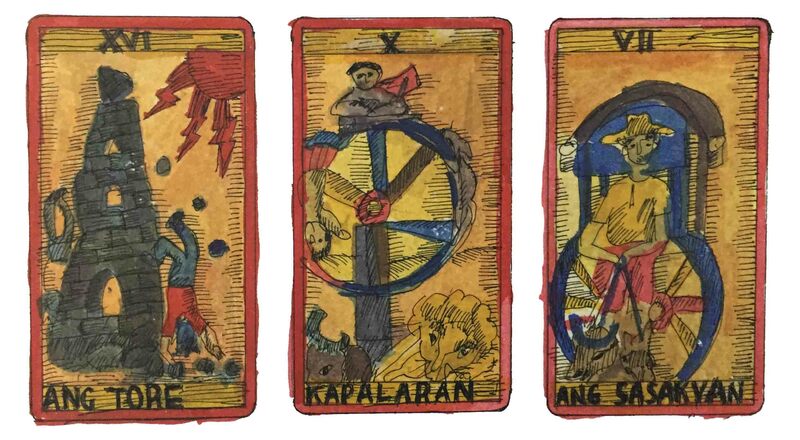 It is what we might call a folk energy, homespun but with worldwide complicities, linking up diverse historical contexts across the Philippine social condition as marked by the presence of woman, the divination of the tarot, and the unfolding of myth. 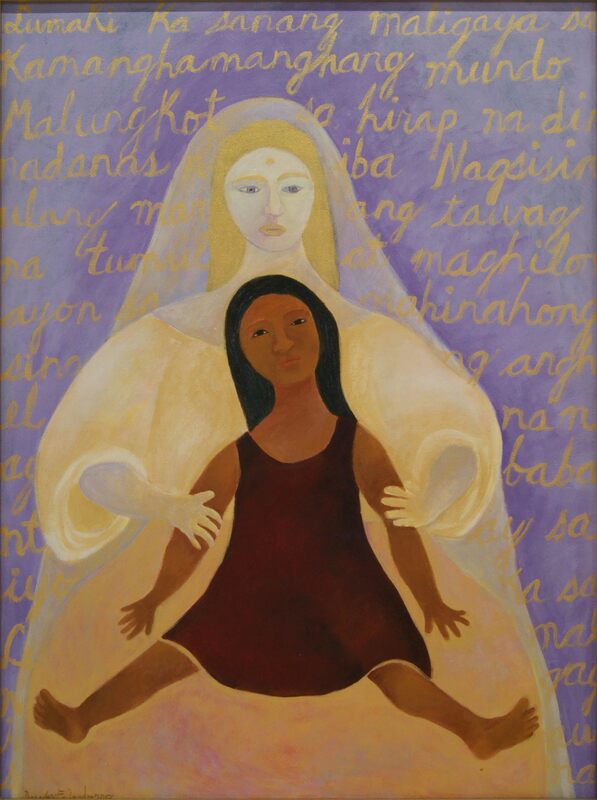 In this regard, Fajardo chooses a repertoire of visual techniques that explore the possibilities of hybrid iconography, narrative, and drawing that relies heavily on color and ornament, a deliberate effort to veer away from a “classical” rendering of form and a diligent attempt to foreground a popular consciousness that has been fleshed out by a range of graphic expressions, from the print to the komiks. 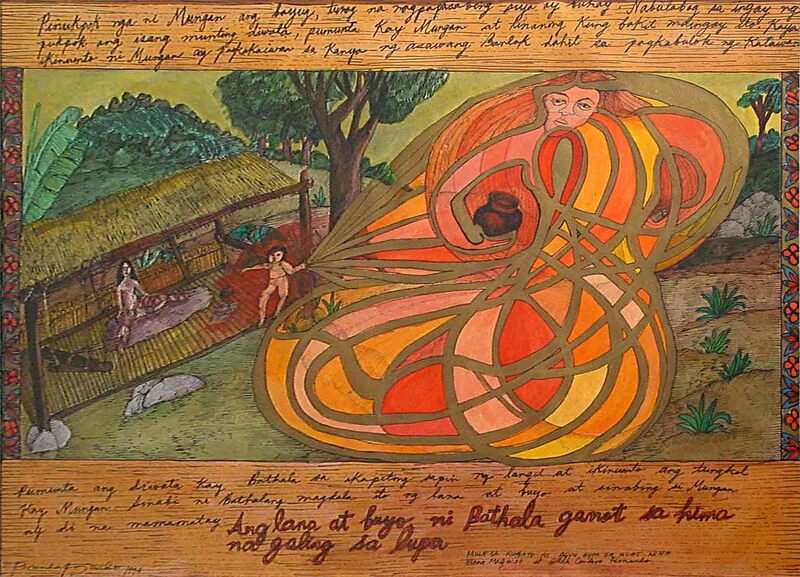 Ink, tempera, and acrylic in the hands of the artist create a vivid sensorium of figurations that are at once familiar and obscure, and therefore productively intractable and tempting. 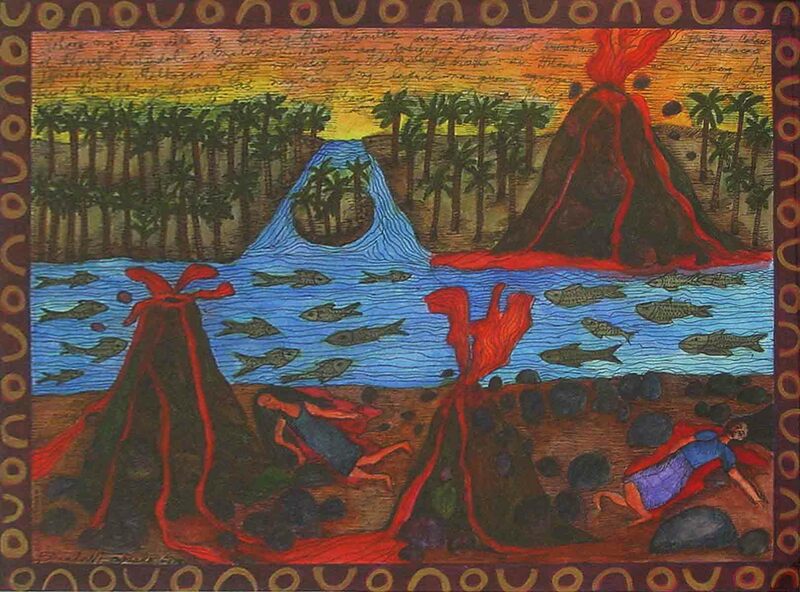 At the heart of this idea and intuition is Fajardo’s insistence on story telling. 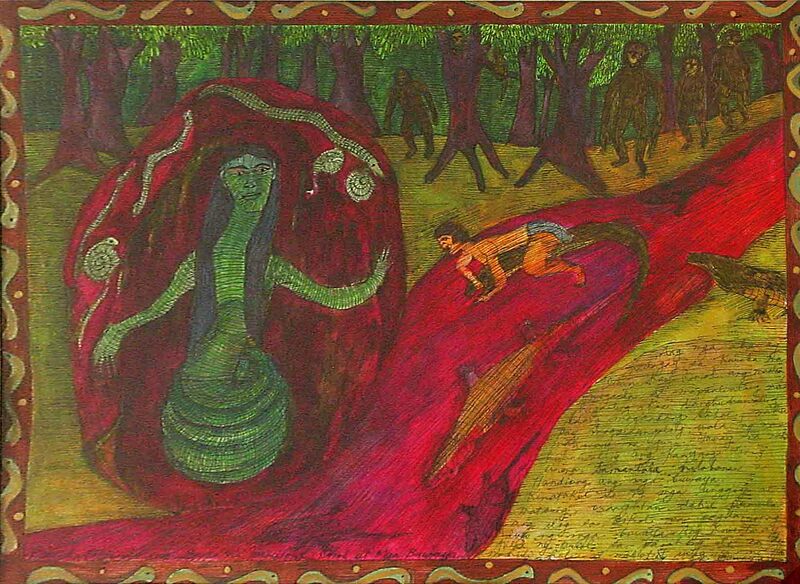 It is her bard-like persona that motivates her to adorn the picture, as it were, with lore and phantasm. 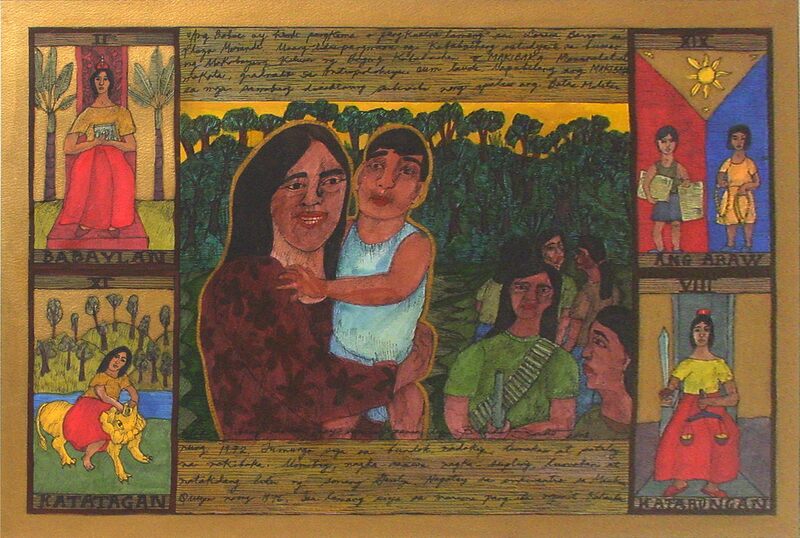 In the Apokalipsis suite, for instance, the central figures are carved into high relief by the myriad details around them, turning the exegesis of the Bible into a compelling allegory of transformation under a distinct historical climate. 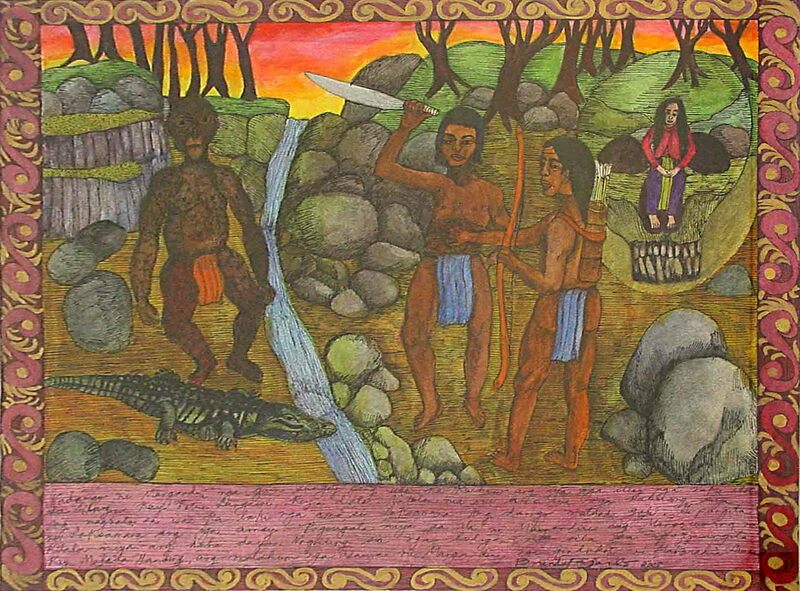 But in the Epiko series, it is text that frames the tale of long duration, of Hadiong in the midst of floods, witches, and crocodiles. It is to be noted that this text is animated by a very everyday gesture: that of writing, of the artist inscribing text onto paper as she would compose letters, for instance, or scribble notes. 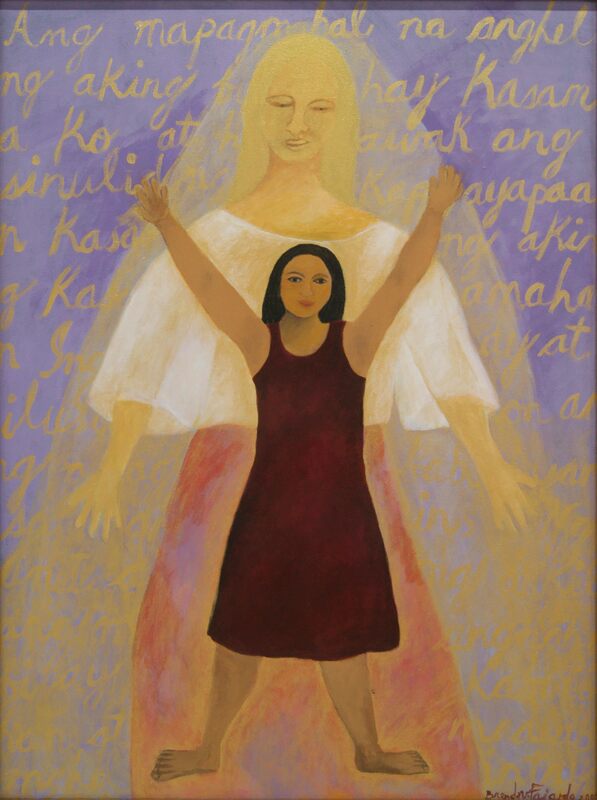 In a way, this becomes an autographic initiation, the signature of the artist is also the basis of her figuration, very much like the folk voice that is simultaneously speaking and singing. 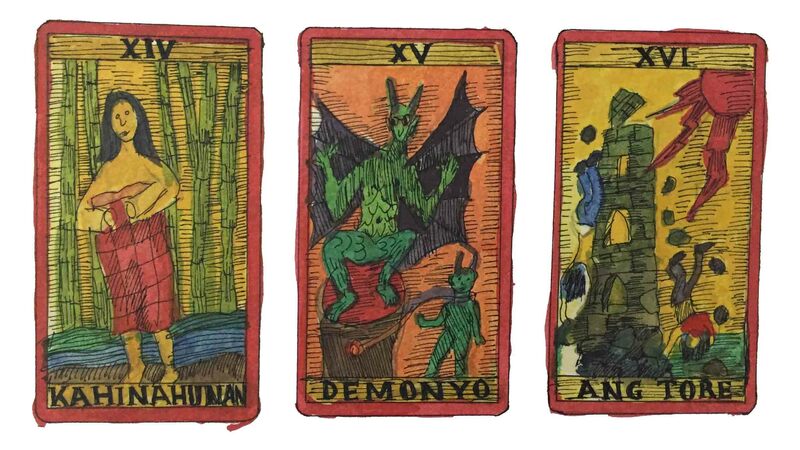 Moreover, this device of telling stories could be in the long arc of her practice traced to her fascination with the tarot, a game and at the same time a technique of the occult emerging from a transitional time between the Medieval and the Renaissance eras. 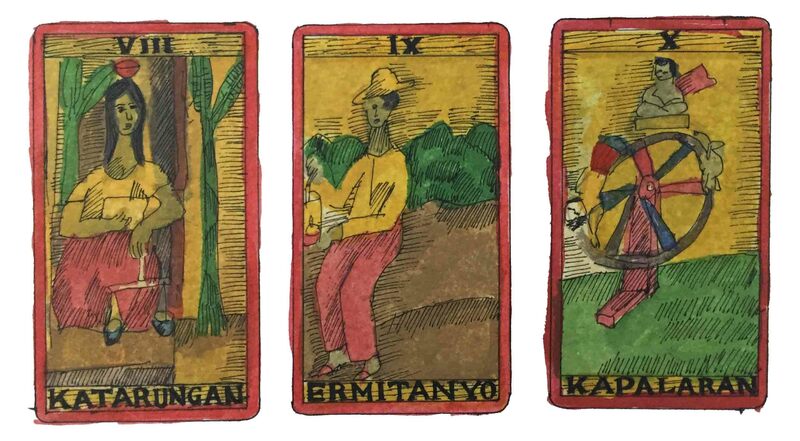 Much can be said about the richness of the tarot as an oracular medium and Fajardo absorbs the implications of the history of this form. 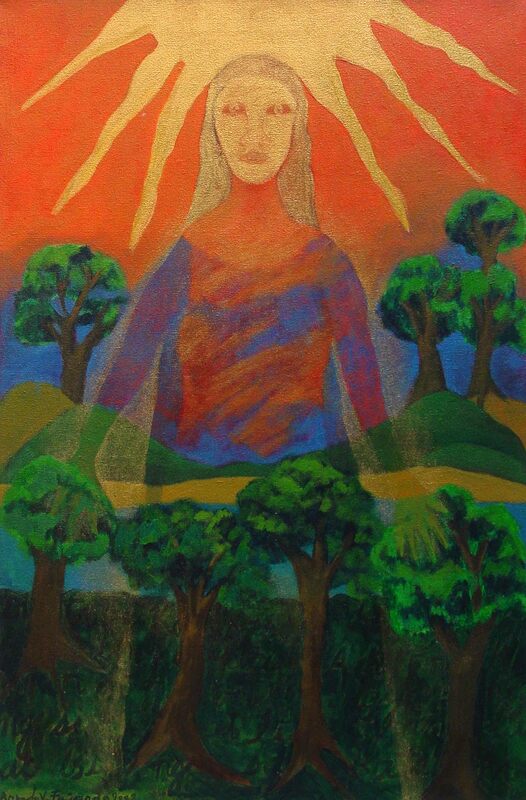 What she does is to transform the arcane or esoteric philosophy underlying it into “spirit guides” that hover, structure, and surround certain types of people, subjects of the quotidian, or symbols of institutions so that an analysis or commentary could surface, a mediation in the present of the ever-present artist. 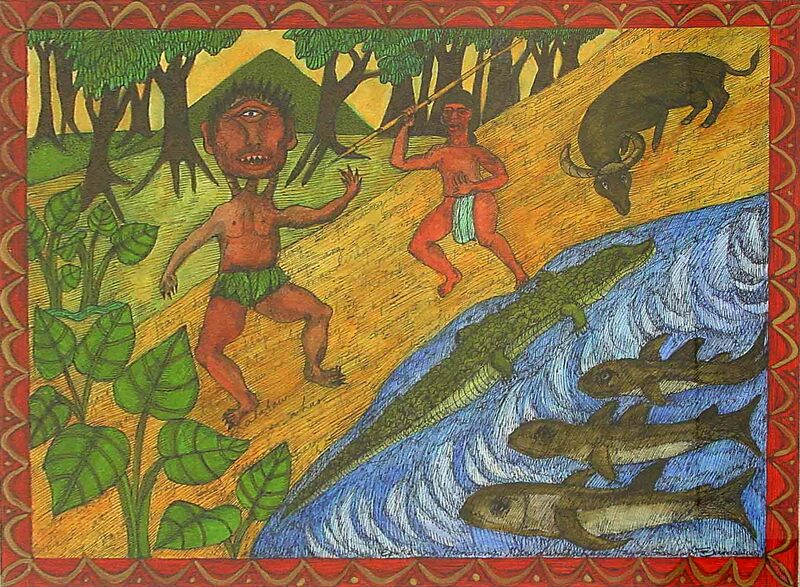 The fool or the priest, lovers and the hermit, and even allegorical figures of equanimity, and the totem that is the tower struck by lightning – they all speak to a social life, the history of power, the critique of authority, and the folly of people as they carry out the errands of their puny but nevertheless prevailing lives. 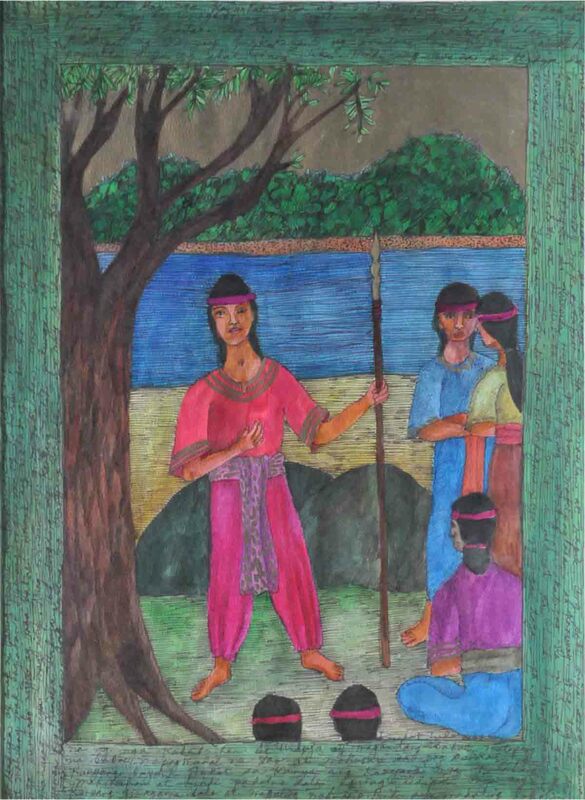 The diviner, therefore, likewise critically annotates history. 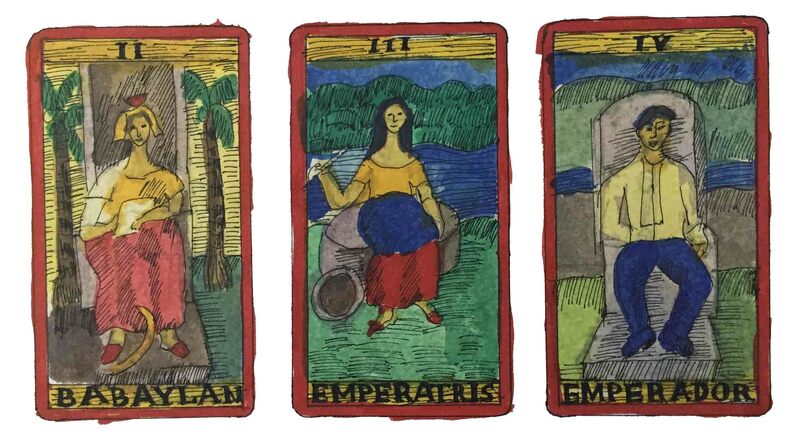 This means that the artist who enlists the tarot in sensing the vagaries of time and place in the same vein reflects on how history moves -- and how it might move in other directions through a consciousness gleaned in thoughtful introspection that begins with a childlike curiosity of forms that transmogrify. 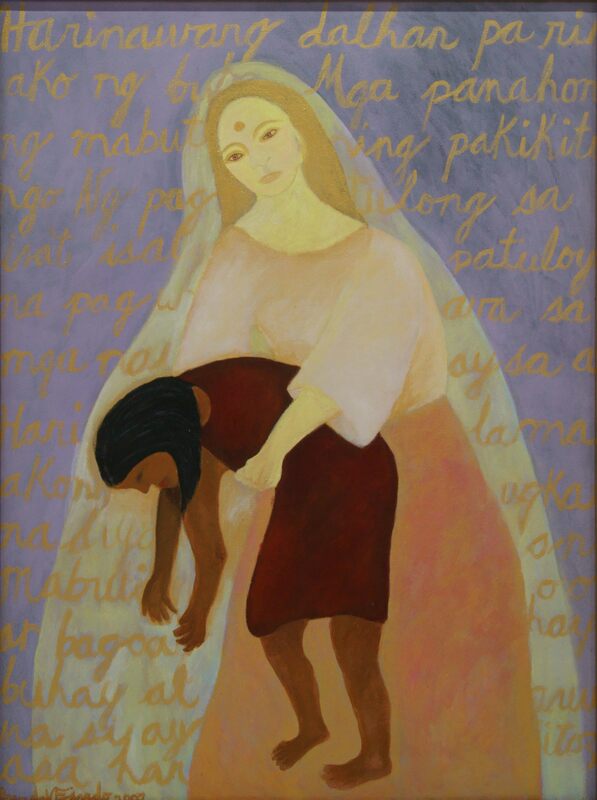 Two works in this exhibition are particularly poignant for Fajardo. 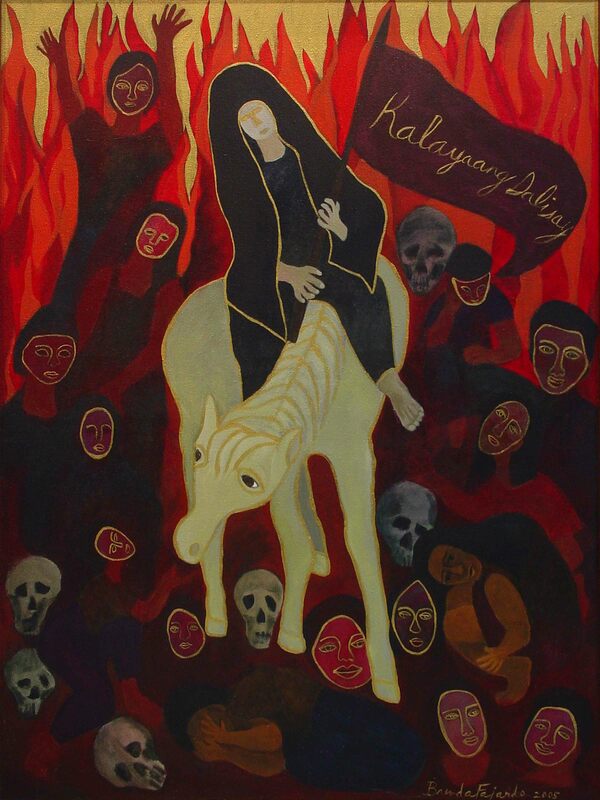 The first is Cabuhi sa Maaslum nga Calamay that revisits the severe conditions in the sugar plantations of Negros, a site of extreme plenty and of extreme poverty. 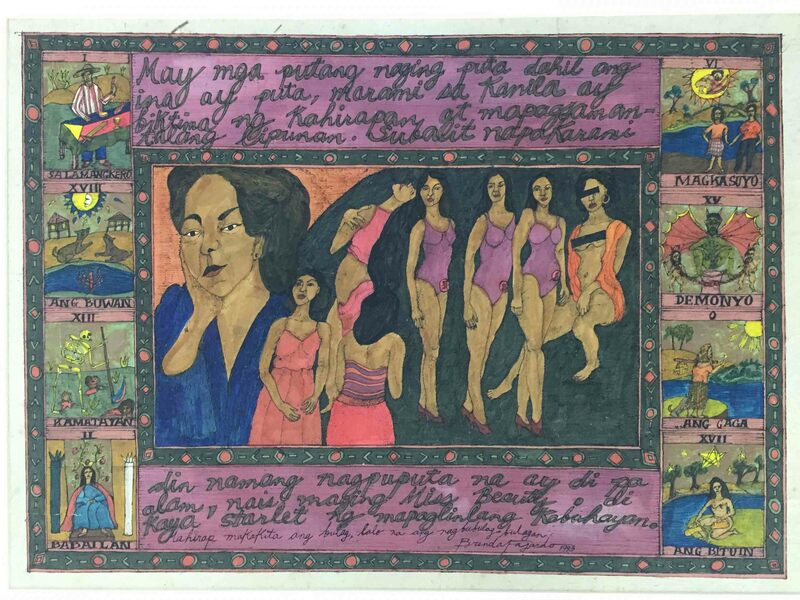 The other one is her Babayi oeuvre in which two women are choreographed in a dance of both patience and agency, rising and falling, raising and resigning. 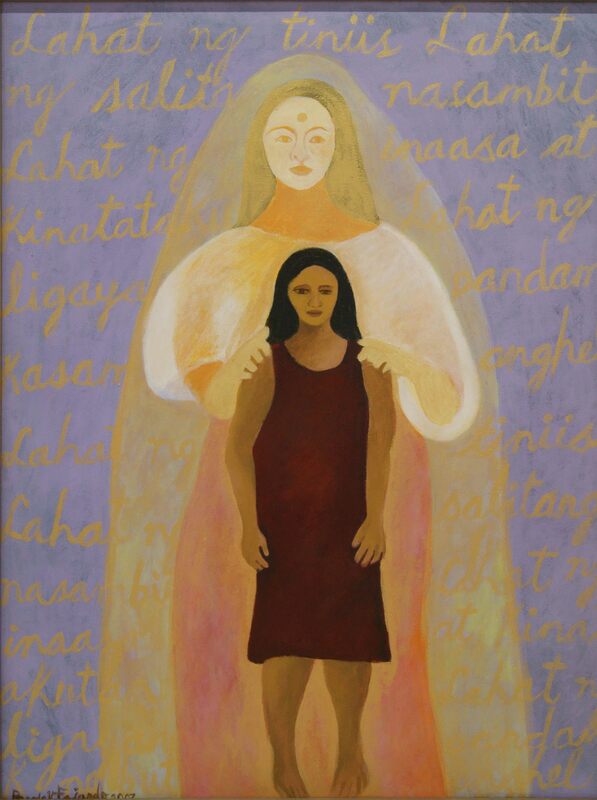 These two works are cogent testaments to Fajardo’s commitment to both investigation and hope. 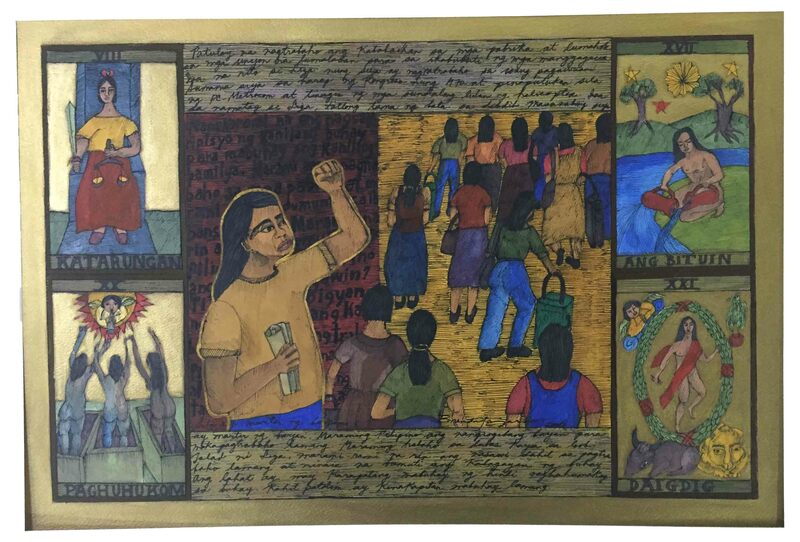 In her extensive practice as artist, educator, cultural worker, scholar, community organizer, and theater maker, Brenda Fajardo has articulated freedom and emancipation as a robust bundle of capacity that enables the person to explore creative potential in the context of both constraint and resolve. 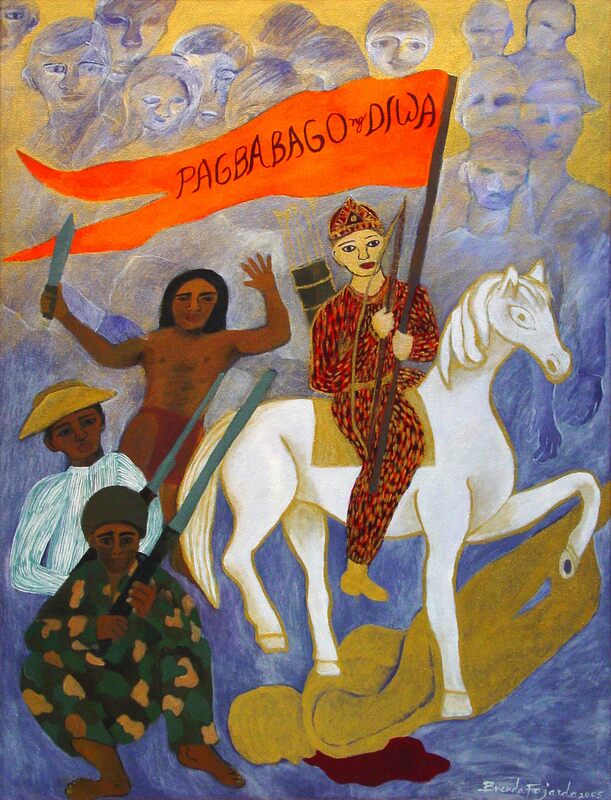 Fajardo’s practice has been interdisciplinary, cutting across teaching art from the primary levels to the university; art making in the contemporary art word; forming seminal organizations in Philippine art education in the sixties and women’s art in the eighties; working with a progressive theater group; helming the visual arts committee in the Philippine culture commission and a biennale of artists from the islands in the Philippines; and organizing farmers, among others. 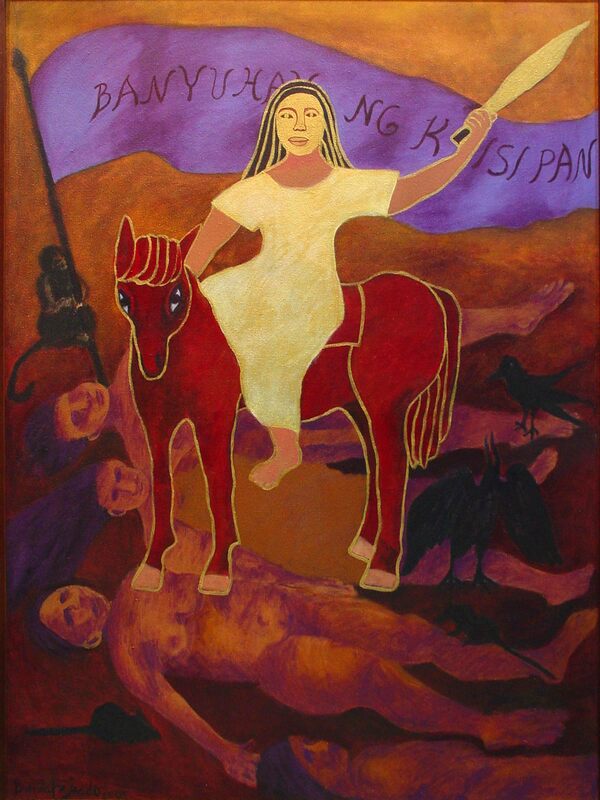 Fajardo’s art is grounded in a lively ecology that liberates the social person profoundly, and her art here in this exhibition in Negros renews the animus of this disposition, further fortifying the woman artist, daughter of Negros, chronicler and chanter of the continuing Philippine story.